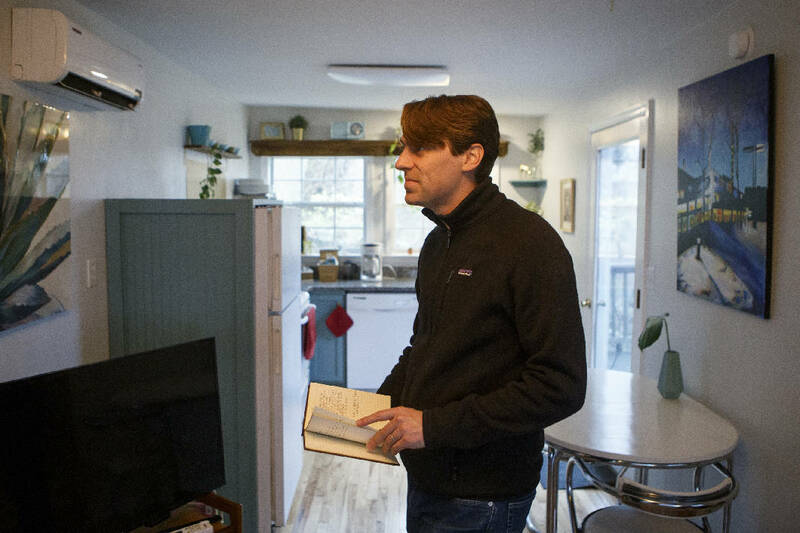 Joel Knutson flips through the guestbook of his Blue Ivy accessory-dwelling unit on Monday, Jan. 14, 2019 in Chattanooga, Tenn. An ordinance to allow accessory-dwelling units, or secondary residential units such as in-law suits or granny flats, in more areas of the city is now being considered by city officials. Fill out the Chattanooga-Hamilton County Regional Planning Agency’s online survey about ADUs here or fill out a hard copy at the downtown Development Resource Center at 1250 Market St. Attend the Feb. 11 planning commission meeting at 2:30 p.m. for a public input hearing. The meeting is in the county commission chambers in the courthouse at 625 Georgia Ave. on the fourth floor. Carriage houses, granny flats, in-law suits, backyard cottages — whatever they're called, the city thinks they could add to the affordable housing options in the city and increase urban infill development. Accessory-dwelling units, or secondary residential units, are now being watched with a close eye by residents and city officials as the city collects public comments and considers an ordinance to allow ADUs in more areas of Chattanooga. Currently, ADUs are only permitted in certain areas of downtown, according to the city's form-based code that was adopted in 2016. The form-based code area encapsulates most of downtown, including the North Shore and the Southside. Survey results released this month by the Chattanooga-Hamilton County Regional Planning Agency show that a majority of residents support ADUs citywide, though. More than 70 percent thought ADUs should be allowed anywhere within city limits and not restricted to one area. Of the 170 survey respondents, nearly 90 percent were property owners in the city. About 70 percent of respondents said they would use an ADU for an elderly family member followed by 65 percent who said they would use it as an income property. About 60 percent said they would use it for visitors. Fifty-one percent were in favor of owner-occupied restrictions while 72 percent said there should be a restriction on the number of ADUs allowed on a lot. Based on the results, staff recommended to city council members at their Jan. 8 meeting that they allow ADUs citywide, allow only detached ADUs at this time, require no architectural design standards for them and have no owner-occupied restrictions. "Although 51 percent would like to see it, it comes down to an enforcement issue," planning staff told council members about owner-occupied restrictions. "It would be very hard for the Land Development Office to enforce owner-occupied restrictions and it would provide more restrictions on homeowners." Council member Carol Berz said she thought the sampling size of 170 was too low to give an accurate representation of the city's 180,000 population. "If it's citywide and doesn't have to be owner occupied, then it's another way of having a short-term vacation rental," Berz said. "There's some unintended consequences. I'm not against what you're trying to do, but we have a habit around here of having unintended consequences because we don't think things through until the end." Planning staff said they tried to get as many survey responses as possible and the agency provided the Times Free Press a list of 19 cities they researched, which included Nashville, Savannah, Georgia; Asheville, North Carolina; Spokane, Washington; Boulder, Colorado; and Portland, Oregon. To gather more input from residents, planning staff reopened the survey and residents can fill it out online here or fill out a hard copy by visiting the downtown Development Resource Center at 1250 Market St.
Nobody knows the exact number of ADUs currently permitted in the city, but city staff said they estimate there have been six legal ADUs built since 2016 when the form-based code was adopted. The county does not designate or track ADUs. In Portland, the city waived certain development fees and reduced regulatory barriers to ADU development in 2009, which resulted in a 400 percent increase in annual ADU permits in just four years. They do not require properties with an ADU to be owner-occupied or to supply additional on-site parking. In Nashville, the city only allows ADUs if no historic structures are demolished. In Asheville, attached ADUs are allowed to be larger than detached ones to encourage the conversion of wasted space in existing homes into rentable units. On Lookout Mountain sits a bright blue cottage nestled against a rock wall built by the National Park Service more than 70 years ago. It's a quaint, one-bed, one-bath cottage that Joel and Katie Knutson turned from a rundown building into a mid-century modern, mountain gem. The Knutsons bought their home on the mountain five years ago and began the demo on the second, rundown building in hopes of turning it into a usable ADU. Although the roughly 500-square-foot unit isn't within Chattanooga city limits, they live in Hamilton County and their property borders the national park. "When we first got this place, it looked like an episode of Breaking Bad," Joel joked. "It was really scuzzy." So, they borrowed the money and began work. Once it was livable, Katie's parents moved in while they waited for their home in St. Elmo to be built. Then, they met friends of some friends who wanted to downsize for a year and save money. After they left, Joel met someone through his full-time job who needed a place to live so he didn't have to fly back and forth to work from Chicago every week. Once Joel's co-worker moved out, another man moved in on a month-to-month basis who had just gone through a divorce and needed a temporary home. Over the years and through their tenants and family members, they would add little things in the space here and there to make it cozier. As much as they enjoyed helping friends and family, they wanted there ADU to serve a different purpose. "Our little cottage here was meant for something happy," Katie said. "It's not really meant to be a long-term residence. This needs to be more than just a place to squat." So, in Nov. 2017, they took the leap to Airbnb and haven't looked back since. Katie now manages the "Blue Ivy" cottage and "outdoor lovers' cabin" full time while Joel continues to work full time at a start-up tech company in Chattanooga. "It's been a really good supplement to our life, and we have been able to work it in our regular family comings and goings," Katie said. Being on the property has also helped, they said. They feel that being near the unit helps remind people to be respectful while still allowing them their privacy. If it wasn't an owner-occupied ADU, then Joel said he feels like the responsibility would fall to their neighbors to keep an eye on their visitors and that would be unfair. "This is going to get more care and attention than a standard rental property," Joel said. "If anyone stays in an ADU then they need to be comfortable with a lifestyle that their landlord would have full insight into." Elizabeth Miller, an Old Mountain Road property owner in the downtown St. Elmo neighborhood, said she worries about ADUs turning into short-term vacation rentals and displacing more people. She has seen the St. Elmo neighborhood change in recent years as an influx of higher-income residents have moved in and housing prices have skyrocketed. Every property is different, but the neighborhood has several properties with ADUs that were built in the early 1900s — far before the adoption of a 1961 zoning ordinance — and are likely grandfathered in and considered "legal nonconforming." Matt Lyle, a project architect at Franklin Architects, thinks ADUs and short-term vacation rentals are two different conversations, though. One is about the building structure and the other is about how to use that building, he said. "First, we need to answer 'Do we allow this building typology?'" he said. "And if so, then we move the conversation to 'What do we allow for the occupancy of that building?'" Lyle, and his colleague Lauren Dunn, said ADUs could be used to address the affordable housing crisis in Chattanooga. Lyle states that ADUs and their uses is a national policy question that a lot of major cities are grappling with, and they can be an effective way to provide more affordable housing options, provide extra income for homeowners and increase the city's tax coffers. "While ADUs are not going to change the entirety of Chattanooga overnight, it's adding one tool to the toolbox," he said. "Over time, with multiple small, incremental improvements then it all adds up to a more sustainably built environment." Planning staff will present the findings to the planning commission at their Feb. 11 meeting and there will be an opportunity for the public to provide input at 2:30 p.m. The meetings are held in the county commission chambers at the courthouse at 625 Georgia Ave. on the fourth floor.